Figure 1: This figure depicts the defect hole in the pediatric endotracheal tube near the pilot balloon entrance point. I am writing to report a case of a defective pediatric endotracheal tube (ETT) that has implications for patient safety. A 14-day-old infant was induced intravenously for a sternal wound irrigation and closure and a 3.5 cuffed endotracheal tube was placed. A circuit leak resulted in inadequate ventilation, but despite checking all circuit connections from the machine to the endotracheal tube it could not be readily identified. Adding additional air to the endotracheal tube cuff did not perceptibly decrease the leak. Humidifiers tend to be a frequent source of circuit leaks, but all connections were intact in this case. An audible air leak sound was detected when listening closely to the patient’s airway. Therefore, we removed the endotracheal tube from the airway and replaced it. Inspection of the tube showed a 3 mm diameter hole in the wall of the tube just proximal to the insertion of the pilot balloon (Figure 1). We notified the anesthesia technicians who examined our stock of twelve more tubes with the same lot number. Close examination revealed that the “defect” proximal to the insertion of the pilot balloon was variable in size and depth in these tubes (Figure 2). Figure 2: This figure depicts defect holes within multiple pediatric endotracheal tubes near the entrance point of the pilot balloon. The holes are of varying diameter. 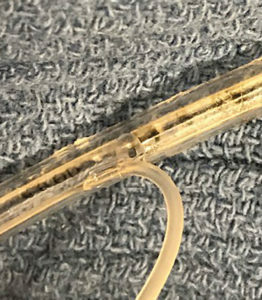 At least one of thirty-eight pediatric anesthesiologists in our group recalled a similar incident of difficult-to-isolate circuit leak, and it is possible that a similar ETT tube defect was missed. 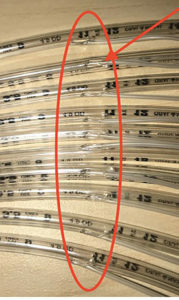 An additional tube was found to have the same defect, approximately one and a half months after the initial defective ETT was found. A different lot number from the same manufacturer was noted on the packaging. This has led to a complete removal of 3.5 cuffed endotracheal tubes produced by this manufacturer and replacement with another product. The endotracheal tube defect specific to the manufacturer was submitted to the FDA and the manufacturer. We hope that this information is helpful to anesthesia professionals in a similar scenario. Dr. Lindsey Loveland Baptist is Assistant Professor in the Department of Anesthesiology at the Medical College of Wisconsin and Associate Pediatric Anesthesiology Fellowship Director at Children’s Hospital of Wisconsin, Milwaukee, WI. Dr. Loveland Baptist reports no conflicts of interest. Upon receipt, Teleflex visually examined the endotracheal tube (ETT) and confirmed a hole in the tube, as originally reported. Teleflex was able to reproduce holes in other ETTs by excessively pressing the tube against the notch block during the manufacturing process. Based on these findings, Teleflex has re-trained all operators, implemented tightened sampling for the in-process inspections, inspected product in inventory (which found no nonconforming devices), and conducted a risk evaluation as per our internal procedures. Furthermore, Teleflex has opened a Corrective and Preventive Action (CAPA) Project to establish long-term corrective actions and prevent the recurrence of this failure by reducing variability in our manufacturing process. Teleflex endeavors to manufacture its medical devices to the highest possible standards and has comprehensive, active quality systems in place to assure these standards. We are indebted to you for highlighting this issue with one of our devices. This report has enabled us to identify an area for improvement in our manufacturing process. We regret the occurrence of this incident and ask that anyone who experiences such an incident to please report it to us so that we can continuously assess our quality system performance and any needs for further investigation. 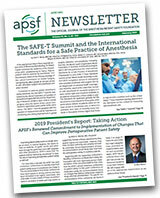 Patient safety remains the focus of all that we do.